Deesigns by Nina Dee: New Stampin' Up! Catalog, Ribbon Shares, and DEEscounted Stamps! New Stampin' Up! Catalog, Ribbon Shares, and DEEscounted Stamps! Well, I'm a little behind after a busy beginning of June, but I wanted to share the new Stampin' Up! Catalog with you, if you haven't had a chance to take a peek yet! Aren't the new stamp sets just divine!? My order came in the other day and I am just dying to play with my new goodies! Don't worry, you'll get to see a nice sampling on Tuesday with our Pals Blog Hop! 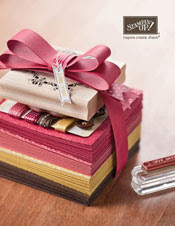 You know that one of my absolute favorite things about a new catalog is... You got it... RIBBON! My new ribbon shares are posted, so be sure to check them out! Click here to view more information on the new Ribbon Shares! Also, some more of my retired stamp sets will be posted soon, so be sure to stay tuned!